The most important part of any Confederate Army soldier's kit was his hat; favored almost universally over the regulation kepi, for its comfort, and ability to keep the elements at bay. In 1852, a Hungarian patriot named Louis Kossuth introduced the Slouch hat into the U.S. At first the slouch hat was defined as a soft hat with a low crown and medium brim. Over time, the term "Slouch hat" became a generic term describing most southern hats of the period. By the time the Civil War began, the term "Slouch hat" was used to describe hats with different types of crowns and brim widths, and in a variety of popular colors: black, gray, brown and tan. Unlike European inspired kepis and forage caps, slouch hats were one of the only all-American articles of clothing worn during the war. One popular slouch hat style was the Beehive. This style was a product of wartime, and is unique to the Civil War period. Very few photos show this style after the war. The Beehive hat was less time consuming to produce, and enabled local hatters to meet demand. The brim dished up in a concave fashion, and generally the brim was flat. The brim measured 3 to 3 1/2 inches wide, and crown 5 to 7 inches or more. After the war, makers returned to producing the more time consuming styles, and the Beehive was rarely seen. Thousands of hats were imported from England to meet demand, and another popular style was a medium brown color, with a rounded crown and fashionable rolled brim, preventing the brim from obstructing ones vision. Most hats of this period were trimmed with grosgrain ribbon. Although grosgrain ribbon was previously used on hat brims, the sewing machine contributed to popularity with hatters, since it made adding ribbon to the brim much faster and less expensive than handwork. In 1861, the inability to clothe volunteer troops led several states to adopt a black felt hat that was "looped up" on one side, thus copying 1858 style headwear. Hat badges or regimental numbers and letters occasionally decorated their hats, although this practice was rare. 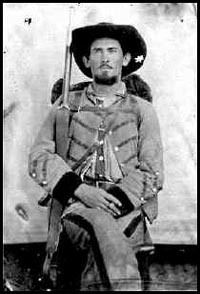 Sources noted soldiers of the 18th and 21st Georgia wore a hat insignia; but generally, hats were left unadorned, having no ornamentation or hat cords. During the Gettysburg campaign some troops found themselves resembling scarecrows, their hair sticking out from hats with holes. As they traveled through Pennsylvania, the men would swap hats with unsuspecting civilians who were watching them pass. Slouch hats became the preferred headgear, rather than the regulation kepi; and in 1864, quartermasters began issuing the slouch hat.